If you’re looking for some outdoor lights that are efficient, economical and eco-friendly then you’ve arrived at the right place. Solar porch and patio lights are suitable for your porch, patio, deck, balcony, gazebo, garage, shed or any other outside location that requires additional lighting. Whereas some of these lights are conventional spotlights, others are actually motion sensor lights which are only activated when movement is detected, making them ideal for warding off intruders and lighting up the walkways and stairs leading to your front door when you arrive home late at night. They can also be used to accent and decorate your landscaping and garden beds. And the best part is that these lights do all this by harnessing the power of the sun itself. No need to worry about electrical wiring, external power source, OR power bills. Just set these lights up outside in an area where they will receive plenty of sunlight and they will charge during the day so that come nightfall they are ready to go lighting up your yard. Easy! Are you convinced yet? In this article we will review 6 of the best solar porch and patio lights currently available on the market, in the hope that this will better enable you to find the set of lights that are right for YOU. This is efficient, economical and eco-friendly outdoor lighting at its finest; in order that you can enjoy its benefits NOW, let’s look at some of the best solar porch and patio lights out there today. Down below are our reviews for each of the 6 best solar porch and patio lights. Features like automatic dusk-to-dawn operation, monocrystalline silicon solar panels and bright illumination are what makes this patio solar light one of the best ones. If you want a money and energy saving alternative to conventional electric outdoor lights, then this GS-106FPW-B solar porch light from Gama Sonic may be the product for you. With this purchase, you get a 5 LEDs lamp emitting 80 lumens of light in total; after charging out in the sun during the day it turns on automatically at dusk ready to provide light to your property throughout the night. Ideal for porches, patios, decks, balconies and more. Just set it up in your yard and let nature do all the hard work. With its corrosion-resistant, cast aluminum design and construction, this solar powered porch light will stand up and be counted in all weather conditions – snow, sleet, rain, hail and scorching sun, you name it. Another fantastic feature of these little solar patio lights is that you get to select the LED color. Choose between extra-bright white/blue (80 lumens output), and warm white/yellow (70 lumens). All the installation hardware for these solar powered patio lights is included in the box, you can either stake in the ground or hang from your wall of choice as a light sconce. Overall, this is a really good, solid outdoor solar-powered lighting option from Gama Sonic, well worth the investment of time and money. Solar powered outdoor lighting: illuminate your porch and patio using the power of the sun alone. No wires, no external power source, no electricity bills. Just set it up in the sun and it will charge automatically throughout the day, so that come nightfall your patio solar lights are good to go illuminating your property. This is the eco-friendly and cost-effective outdoor lighting option. 5 LEDs, maximum 80 lumens output. This solar powered porch light is suitable for all outdoor uses, use it on your porch, patio, deck, balcony gazebo or more. Includes crystalline silicon solar panel which efficiently absorbs sunlight and is protected by sturdy tempered glass for extra long lifespan. Comes with one 3.2 volts, 1500 mAh lithium-ion battery, charges efficiently and good for 1000 charges. Two brightness/color mode to select from: choose either 80 lumens of cool bright white/blue light, or 70 lumens of warm white/yellow. Built from sturdy powder coated and corrosion-resistant aluminum, these are solar lights for patio that stands up under all weather conditions. Two brightness/color modes to choose from. Aluminum construction and design is sturdier than metal. Nice bright solar patio lights, 80 lumens worth. Generous product warranty (2 years), a testament to this product’s quality. Mounts easily on walls, horizontal surfaces or by staking in the ground. All the tools you will ever need are included. Some customers report that you only get about 4-5 hours’ continuous lighting coverage tops from these lights, even on the lower settings. Looking for an accent light for your porch or patio? Check out this Solario solar powered light that looks styligh and gives out powerful light, too. 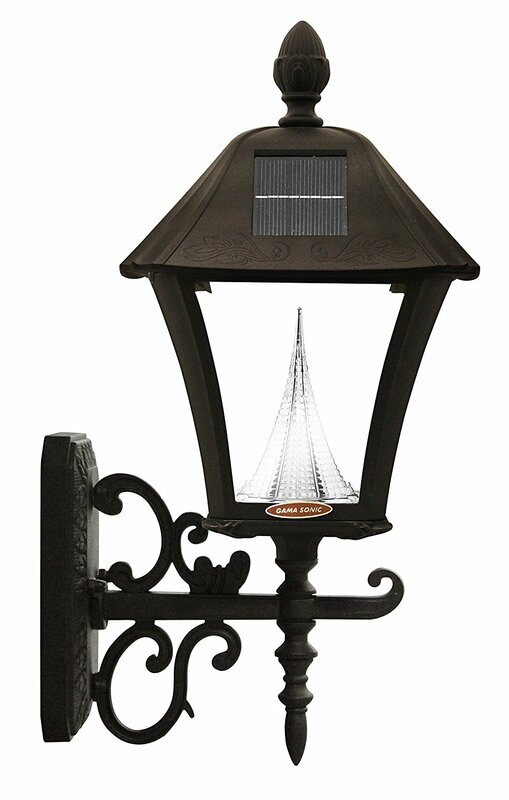 Impress all your neighbors and friends with this beautiful outdoor solar porch light from Solario. With their fully solar powered porch light you get 4 LEDs and 9 hours’ night-time coverage on a full charge. One of the LEDs stays on constantly, emitting a warm white/yellow colored light, whilst the other three – that emit a bright white colored light – are actually motion activated, saving you power for when it’s needed most. The PIR motion sensor has a range of 15-20 feet and 120 degrees, so you can be sure nothing will make it past them; these solar patio lights are equally useful at deterring potential intruders as they are at illuminating your yard. They are easy to install (just use the included mounting screws, they attach to any wall or surface), and with durable ABS waterproof plastic construction you can be sure they will be illuminating your property THE WHOLE year around. If you want solar powered outdoor lighting that saves the environment AND your energy budget, all the while lighting up your porch and patio with style and sophistication, you’ve arrived at the right place with Solario. Solar powered simplicity: light up your porch and patio, or accent your landscaping and home decor, with these FULLY solar powered outdoor lights. You just set them up outside in a location where the solar panel can collect plenty of solar rays, and it will automatically charge the battery throughout the day. 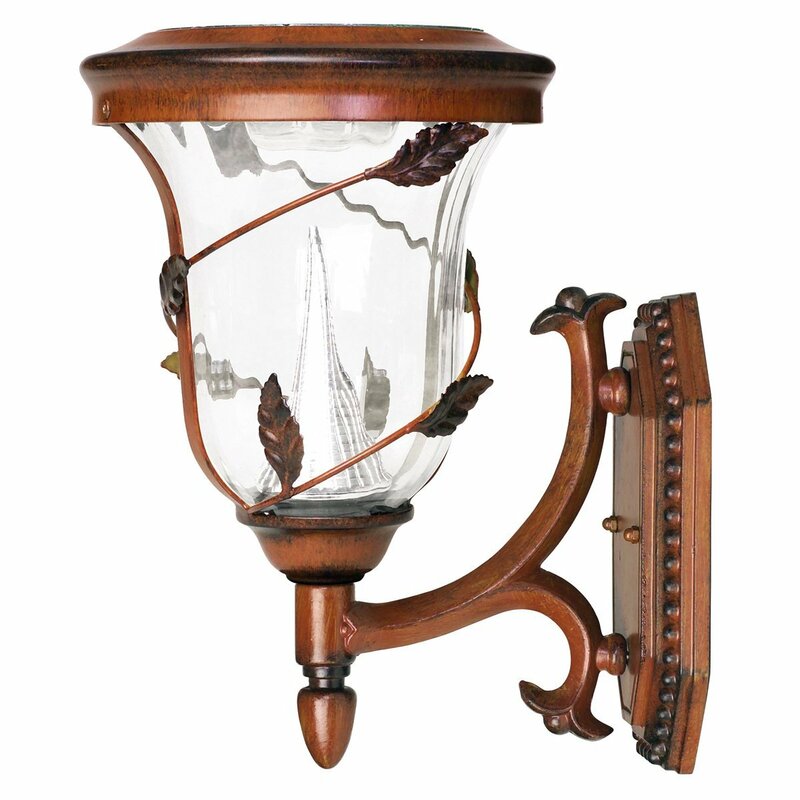 Come nightfall your solar powered porch light will be primed to utilize all that accumulated energy as light. This is efficient, effort-free and eco-friendly outdoor lighting. Attractive accent lighting, you get 4 LEDs, one yellow-emitting LED stays on constantly, the other three bright, white ones are motion sensor activated. Automatically activates on at dusk, off at dawn. PIR motion sensor lights automatically turn on when movement is detected within 15-20 feet, spanning 120 degrees. Use these solar patio lights to ward off intruders, light up the steps and walkways to your house, and more. Comes with one 800 mAh, Ni-CD rechargeable battery, on a full charge it supplies light to your property’s exterior for up to 9 hours at a time. Hassle-free installation, just screw onto any wall, pole, post etc using the screws included in the box. Durable and waterproof ABS plastic construction and design, these solar lights for patio really are built to last. Will stand up under all weather conditions. These solar lights for patio double up as a normal spotlight and a motion sensor light, very versatile. Provide up to 9 hours’ coverage when fully charged. Installation is easy, just use the screws provided. The one yellow LED is really not bright enough to act as a conventional spotlight. No ability to adjust ambient lighting levels at which it turns on/off. No ability to adjust the brightness of the motion activated lights, their range, or the length of time they stay illuminated for. With attributes like the lasting power of 10 hour on a full charge true white illumination of 120 lumens, this is a great solar light for bog patio and porch. Here is another quality offering from the folks at Gama Sonic. This solar powered outdoor solar porch light will easily and effectively illuminate your porch, patio, deck, pathways, shed or garage. You get six LEDs emitting a grand total of 100 lumens of light, and it’s designed to operate continuously from dusk until dawn. You just place these patio solar lights out in the sun where during the day the included solar panel (which can be positioned up to 8 feet away from the light itself) will steadily collect solar rays, charging the battery, so that when nightfall arrives your solar powered patio lights are good to go illuminating your yard. No wires, no ongoing maintenance, and no power bills! This is truly effort-free outdoor lighting. It’s also economical and environmentally sound as well. And it does it all with style and class. 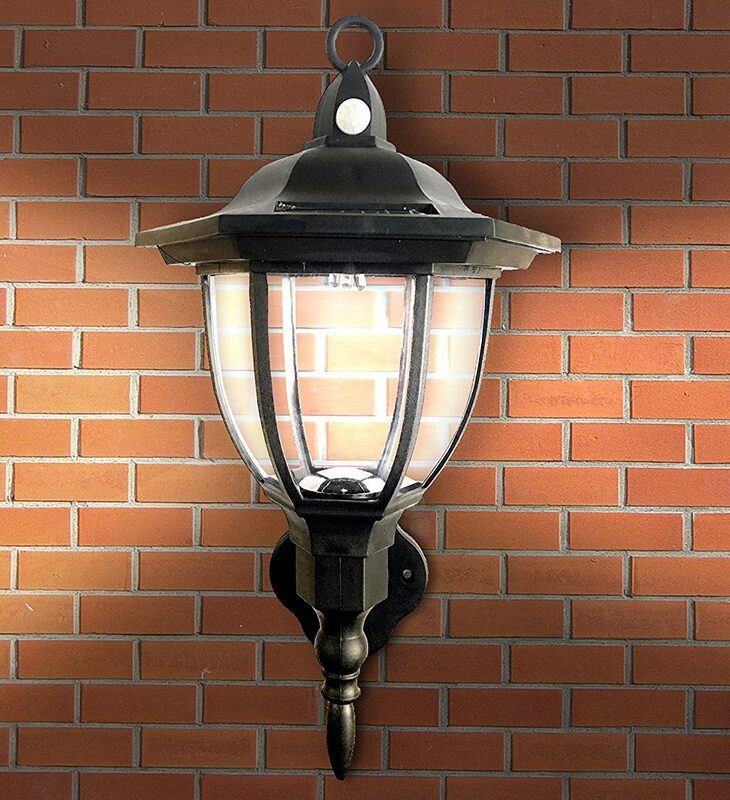 Easy to install on any surface, and with durable cast aluminum construction and design, sporting a brown-colored powder coated finish, this solar powered porch light will get the job done under any climactic conditions. For versatile and effective outdoor lighting that won’t break the bank and also allows you to become a responsible environmental citizen you can’t go past Gama Sonic, this offering of theirs’ is another gem. Outdoor lighting powered by the sun itself: why PAY for electricity when you can get it FOR FREE by harnessing the sun’s rays? No wires, no electricity bills, no ongoing maintenance necessary. Just set these solar patio lights up in the sun and they will charge automatically during daylight hours; come dusk they will be ready to go lighting up your property. Super-bright and effective outdoor solar patio lights, you can 6 LEDs and 100 lumens of light. It’s suitable for all outdoor uses, including your porch, patio, deck, balcony, garage, shed and more. Also available with PIR motion sensor, 15 feet range: choose the product that is right for YOUR place. Turns on automatically at dusk, and off at dawn. One rechargeable lithium-ion battery included, provides up to 8 hours’ lighting coverage on a full charge. High-tech crystalline silicon solar panel, can be placed up to 8 feet away from the light itself; position for optimal sun exposure and more effective lighting. Easy to install, just use the screws provided. Built from weather proof, powder coated cast aluminum with glass lens and brown finish. These lights are tough AND look good. Also available as a motion sensor light, choose the light that’s right for you. Aluminum material, hardier than plastic. These solar lights for patio also look great. Able to detach the solar panel and position so as to maximize sun exposure. Glass lens, keep it out of reach of your pets and children! Mounting screws are too long for their purpose, have to cut to install the light properly. Reports of water leaking inside the casing during periods of heavy rainfall. Not able to adjust the ambient lighting levels at which it turns on or off, with the motion sensor model, the brightness and range of the patio solar lights or how long they stay activated for. Need an outdoor solar wall lighting that will be bright, durable and long-lasting? This LampLust solar patio light could be the perfect choice for you. This is another fantastic outdoor lighting option, this one from the folks at LampLust. This pack of 2 outdoor motion sensor lights are ideal for your porch, patio, deck, garage, deck, walkways or any area that needs additional night-time lighting. This is ‘two in one’ lighting, the solar patio lights are activated automatically at dusk (turn off at dawn), one LED stays on constantly (yellow glow), the two (warm, white colored) are activated whenever motion is detected within an 18 feet range of the light, and for 60 seconds of no further motion. And the best part is that they are fully solar powered, so no need to worry about complicated electrical wiring, external power sources or power bills. Just place these solar lights for patio out in the sun and they will charge automatically throughout the day; come nightfall they will have plenty of energy store up for you to use as light for your property. They’re simple to install as well, and have waterproof plastic design and construction that GURANTEES these solar powered patio lights will be illuminating your home for many a night to come. Whether you want to light up the steps and walkways leading to your front door of a night-time so you don’t break your neck, or ward off intruders with a trusty set of motion detection security lights, these two solar patio lights from LampLust fit the bill. Highly recommended. Solar outdoor lighting: this solar porch light from LampLust requires no external wiring, power source and provide a FREE source of electricity for your yard. Bypass the electricity companies and take advantage of the energy emitted by the sun every instant, with these patio solar lights. All they need is exposure to sunlight; set them up and forget about them. You get 2 bright LEDs, this is a solar powered porch light that is suitable for all outdoor uses. Light up the walkways and steps leading to your front door, or ward off burglars with these lights. ‘Two in one’ outdoor lighting: one yellow-emitting LED stays on constantly; the 2 LED lights are PIR motion sensor activated when movement is detected within a range of 18 feet; once activated they stay on for 60 seconds of no additional motion, they then transition from two LEDs lighting to one. This is versatile outdoor lighting that saves you power for when it’s needed most. Automatically on at dusk, off at dawn. One rechargeable AA, 3.2 volts 600 mAh LiFeP04 battery. One 4.5 volts, 35 mAh silicon crystal solar panel. Waterproof ABS plastic design, these are truly a set of ‘lights for all seasons’. The motion sensor activated light stays on for 60 seconds, longer than many other comparable lights out there. The ‘steady on’ LED is not really bright enough to function as a conventional spotlight. No ability to adjust the ambient lighting level at which your solar porch light turns on, the brightness or range of the light emitted, or how long it is activated for. Solar panel not detachable from the light, you’re not able to place it in a different location from the light itself so as to maximize sun exposure. Warranty is only for 90 days. This Gamma Sonic solar powered porch light will last for up to 10 hours and will illuminate bright light, that will help you keep your outdoors area brightly lit. Here we have another offering from Gama Sonic; these folks are quality manufacturers of outdoor solar lights and this offering of theirs’ is no exception. With this GS-113W model you get six super-bright white LED emitting a total of 70 lumens of light. This solar porch light turns on automatically at dusk, off at dawn, and is designed to provide a full night’s worth of illumination for your porch, patio, deck, balcony, garage, shed or any other location on your property that requires extra lighting. All you need to do is set it up in an area where the solar panel can collect plenty of solar rays during the day, charging up the battery so that when darkness arrives it is ready to provide a full night’s worth of lighting coverage to your property. In fact, on a full charge these solar patio lights provide 10-12 hours’ continuous lighting coverage. Easy to install and maintain, with no need for complicated wiring or external power source, and constructed with weatherproof, corrosion resistant aluminum, this is a durable, multi-purpose, cost-effective and eco-friendly outdoor lighting option; go and grab a set of these solar lights for patio from Gama Sonic, they tick ALL of the boxes. Solar outdoor lighting at its finest: just set this solar powered porch light up in an area where it will receive plenty of sunlight and it will charge automatically during the day, so that come nightfall it is ready to go lighting up your yard throughout the evening. Super-bright outdoor lighting, you get 6 LEDs and 70 lumens of light. Suitable for all outdoor uses, light up your porch, patio, deck, balcony, garage, shed and more. On a full charge, it provides 10-12 hours’ lighting coverage. Built from weather and corrosion resistant aluminum material, with glass lens. Very bright solar lights for patio. Capable of providing 10-12 hours’ lighting coverage on a full charge. Aluminum construction and design, sturdier than plastic. Glass lens, keep out of reach of your kids and animals. Not able to adjust the ambient lighting levels at which the patio solar lights turn on/off, or the brightness of the light emitted. Amorphous Silicon solar panels, working time of 14 hours and bright illumination are some of the freatures that make this lamp one of the best solar patio lights. Last but not least we have this set of outdoor solar patio lights from Solar Smart Creations. These are actually motion sensor lights; when movement is detected within a range of 15 feet the one LED light emits an ultra-bright 100 lumens of light, more than enough to scare away intruders, and light up the steps and pathways leading to your front door. Note that even in standby mode, these patio solar lights emit a steady glow of 2 lumens; so these lights can also be used to accent your landscaping and home decor. With their efficient and high capacity 3.2 volts, 600 mAh lithium battery, they have a very short charging time (only 4-5 hours), and are capable of providing 10-14 hours’ lighting coverage at a stretch for your property. This solar powered porch light is exceptionally easy to install, and also has sturdy ABS waterproof plastic construction and design which ensures they will stand up under all weather conditions. This is fully solar powered outdoor lighting, so no electricity bills or complicated installation wiring required, all these solar lights for patio need is sunlight! For a set of effective, hassle-free outdoor motion sensor lights that save you power for when it’s needed most, and do it all by harnessing the power of the sun itself, this offering from Solar Smart Creations truly is the ‘smart’ outdoor lighting option! Grab your pack today. Solar simplicity: this solar porch light requires NO complicated electrical wiring, ongoing maintenance costs, OR external power source and there are ZERO power bills to pay. Just set them up in the sun, then sit back and relax. Nature will do all the work for you. This is effortless, cost effective and environmentally friendly outdoor lighting. “Two in one” outdoor lighting. Solar Smart Creations’ outdoor solar porch light emits a steady glow of 2 lumens. When PIR motion sensor detects movement within a range of 15 feet, they boost it up to 100 lumens ultra-bright lights. These solar patio lights are perfect for warding off intruders, illuminating the walkways and steps leading to your front door when you come home late at night, and in standby mode, decorating your landscaping and flower beds. Contains one 3.2 volts, 600 mAh lithium battery, charges fast (4-5 hours), and is capable of providing 10-12 hours’ lighting coverage. 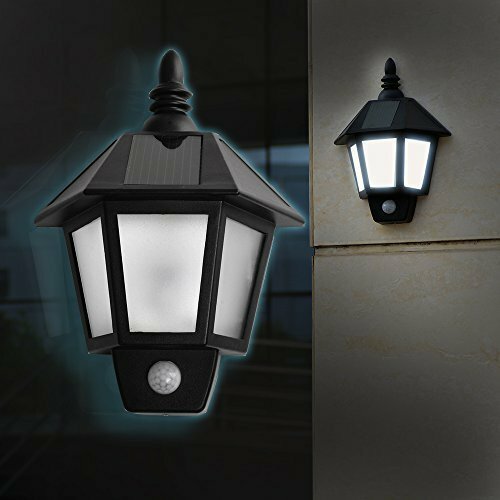 Durable ABS waterproof plastic design, these solar powered patio lights will get the job done in all weather conditions, night after night after night. 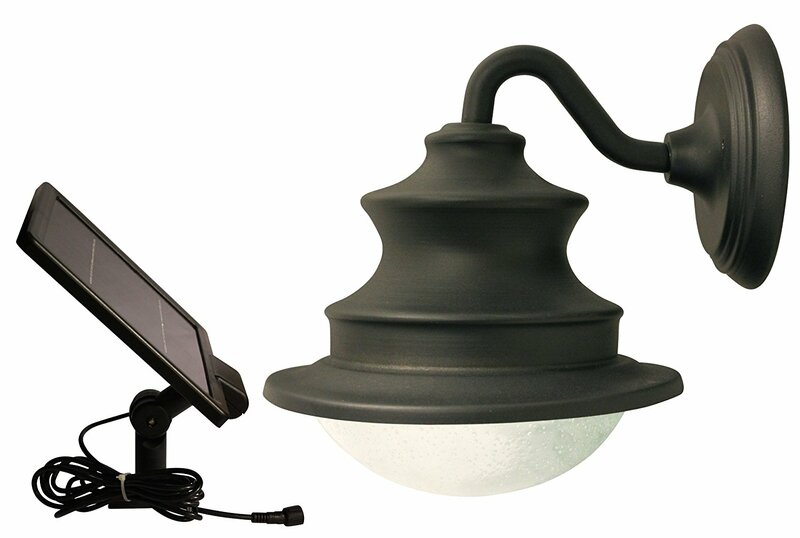 Two in one outdoor light, very versatile. 100 lumens emitted when motion is detected, ultra bright. Very strong battery, short charging time of only 4-5 hours. Provides 10-12 hours’ continuous lighting coverage on a full charge. No ability to adjust ambient lighting levels at which it turns automatically on/off, or the brightness of the light emitted. Not able to adjust the brightness of the motion sensor activated beam, the range of the detector, or how long it stays on for when activated, all of which would save you power. Plastic construction and design, not as sturdy as metal. 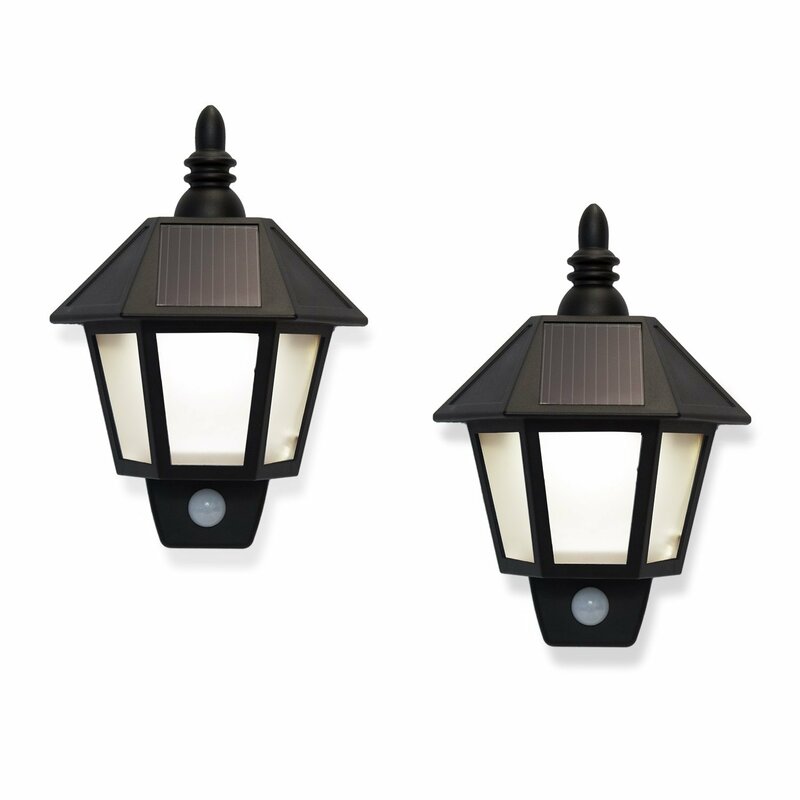 As we have seen, solar porch and patio lights are an extremely convenient and versatile outdoor lighting option. In this article we have considered 6 of the best models currently out there; we hope that at least one of them suits your requirements, and that you can begin enjoying YOUR set of solar porch and patio lights TODAY.